2 Visa Application forms, fully completed, TYPED, and signed. Original signature required on each page. Family visit applicants must provide with their application an invitation from their host in Algeria and notarized at the city hall of the place of residence of the Algerian host. Fax copies are not accepted. Copy of airline tickets or itinerary, showing entry and exit from Algeria, and copy of confirmed hotel reservation. The Algeria visa is issued valid for the specific dates as requested on your applications form. The Embassy of Algeria advises applicants to make their travel arrangements based of the date of entry of your visa. Applicants should not arrive in Algeria before that date. 2 Visa Application forms, fully completed, TYPED, and signed. Original signature required on each page. Copy of itinerary or air tickets showing onward travel. The Algeria visa is issued valid for the specific dates as requested on your applications form. The Embassy of Algeria advises applicants to make their travel arrangements based of the date of entry of your visa. 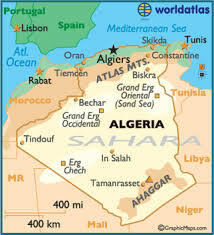 Applicants should not arrive in Algeria before that date.